Such testimonials are common for the CVM to receive from pleased pet-loving clients, and during this holiday season, many are traveling with their pets — and accidents do happen. When they do, the CVM’s Emergency and Critical Care Service is on duty 24-7 with a fully-staffed medical unit and advanced emergency care services and capabilities. 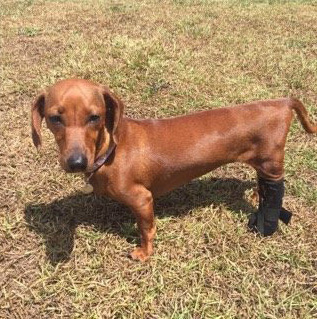 The opening testimonial comes in an email from Haley Alderman, a pleased pet owner from South Carolina, whose miniature dachshund, Lainey, was struck by a vehicle during the summer. The accident occurred during Alderman’s visit with family in Florida. The 2-year-old dog unexpectedly leaped from Alderman’s car into a busy road and was struck by a trailer being pulled by an on-coming truck. The animal suffered severe injuries to her back leg and pelvis. Dr. Katie Nash, left, and Dr. Lenore Bacek are shown with a dialysis machine. 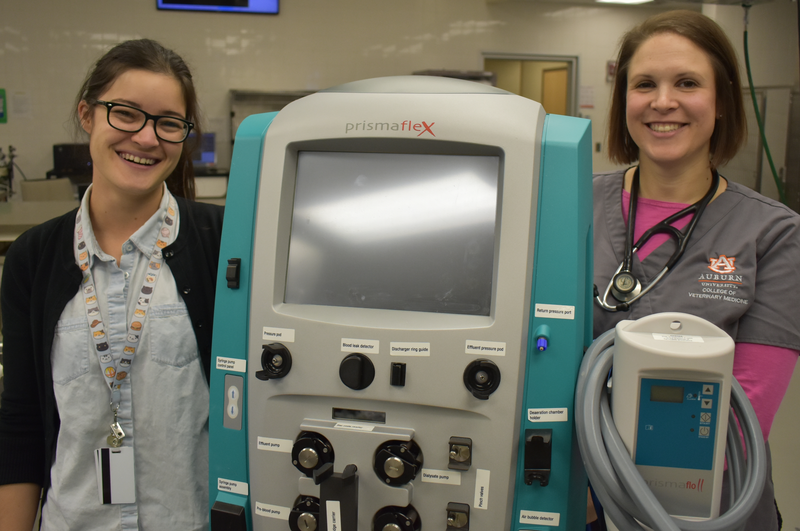 Dialysis is one of the many advanced medical services available through the Auburn CVM Emergency and Critical Care Service. Lainey underwent surgery to repair her damaged leg and pelvis and was able to be discharged to her owner and the care of her primary veterinarian back in South Carolina. This type of pet referral and treatment success story is typical at Auburn’s Emergency and Critical Care Service, located in the Wilford and Kate Bailey Small Animal Teaching Hospital. “We often get referrals from other veterinarians – some from as far away as Florida and Kentucky,” Dr. Nash said. But a pet owner does not have to be referred by a veterinarian to use the Auburn hospital. “We get a lot of veterinarian referrals, but pet owners can just come in with their injured or sick pet,” said Dr. Lenore Bacek, a clinical assistant professor in Emergency & Critical care and also one of the veterinarians who treated Lainey. In addition to its fully-staffed medical unit, Auburn’s Emergency Services and Critical Care has capabilities not generally available at most ordinary veterinarian clinics. The clinic is located on the campus of the College of Veterinary Medicine at 1220 Wire Road, Auburn, Ala. 36832. The emergency phone number for the Small Animal Clinic is 334.844.4690. Additionally, the emergency clinic for large animals is also located on the CVM campus in the J.T. Vaughan Large Animal Teaching Hospital at 1500 Wire Road. Its emergency phone contact number is 334.844.4490.